Love the seaworthy cards. the sunshine card is fab! That Silver Linings die is a must have for me. I make my own sunburst cards all the time and this die will eliminate all the manual hand cutting of the triangles. Your cards are so creative! I am loving the sun burst die in the release. That "Sunshine" card is sure to brighten anyone's day. Thanks for sharing. Love all this sunshine. Love your style and the cheerfulness of these cards. Great cards! Love both of them! Love what you gave done with this release. I want it all. Now that is stunning. I love how you placed these elements together. Love the colour and design. Such wonderful inspiration, love both of these so much!!! JJ you've added sunshine to my day in the most beautiful ways! Thank you! LOve your 'color block' style! Oh, I love the sailboat card combined with the silver linings. So pretty and refreshing. These two cards are so simple, yet amazing at the same time. Love them. I love the designs of both cards! Love the soft touches! Thanks for the inspiration! Your SUNSHINE card is so adorable...love it. Thanks for sharing. Beautiful!! I love the different colors of sunshine. And the second card is really amazing too! OH MY GOSH! so fabulous I mean really fantastic cards. great release. Got to get these stamps. They are the best. Just like you and your cards. Thanks for the inspiration. Love the sunshine word die and the sunshine rays Awesome cards!!! Great use of the dies - can't wait to use these. Both of your cards are terrific! Love the way you used the dies and the colors are so pretty. Thanks so much! Great use of the release. Thanks for sharing. VERY cute cards!! Love this release too!!! I think the salty card is my favorite, with the technique on the yellow sky. I can almost feel the ocean spray!! I'm becoming addicted to this set of stamps. Neat technique. Thanks for sharing. Wow! 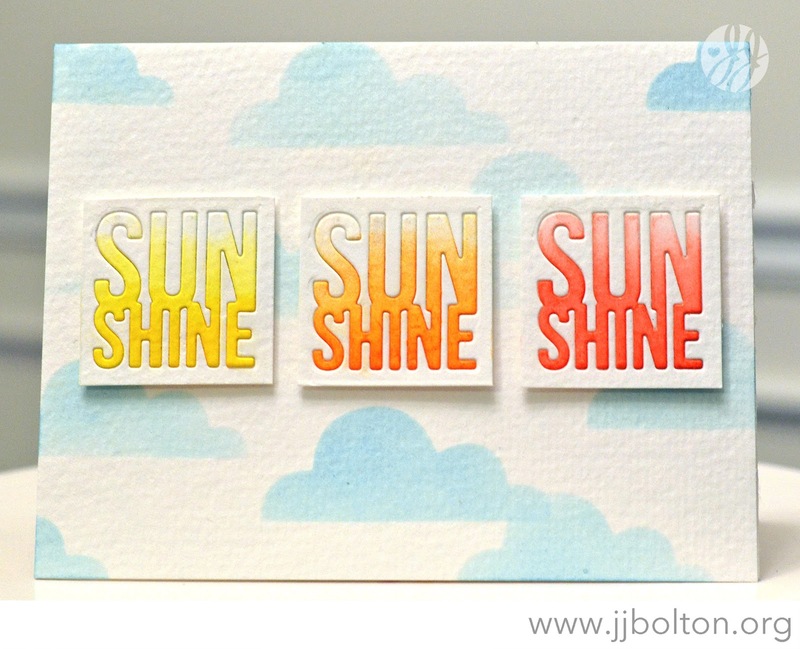 Love the inlaid sunshine ombre sentiments! I love what you did the salty card! As always I love your cards! I didn't think I would need these dies but your cards are making me rethink that. This is a very versatile release and I can already imagine many ways to use these new stamps and dies. Thanks for the chance to win. Both cards are awesome - I especially love the sea scene! Love both your soft and pretty watercolored cards, and thanks for sharing how to use those dies, so clever! Wow!!! Beautiful cards. I love the way you used the dies... especially the rays. Beautiful cards! Must get some of these new products! Wow, these both look super cool! These are so bright happy and awesome! I love your bright and cheery cards, especially the sailboat. It's one I'd love to try. Thanks for sharing! Both of your cards are so cute! My favorite is the second one. Love the sailing scene. The colors are great!! Both of your cards are amazing, but I especially like your scenic Salty Seas card - beautiful sunset. Love your cards, the colors make me smile. Amazing cards! Love the ocean sunset/sunrise one! Such happy cards! Great colors. Wow, really great ideas! The yellow and blue sunshine rays with the boat looks amazing! Thanks for sharing on the blog hop. I really like both of your cards. I like the inlaid aspect of the first one. Very pretty and creative! both cards are so very cool!! Two wonderful cards. Both the Sunshine and Silver Linings die sets are at the top of my favorite list from this new release, and I love your creative use of them both. TFS. You cards are so soothing and relaxing, love them!! The ombre letters are beautiful, and the boat on the water is so cool, my boys would love it! So impressed by your use of these dies. Not sure I'd ever have thought of using the sunshine die multiple times. Thanks for the inspiration. Your card is gorgeous! Very inspiring. Such fun products from Julie! And your projects are great! Fun, happy, cheerful cards! I love your cards - Such great use of the new products. Beautiful colors. Love the way you used the sunshine ray die for the sun AND water. Very inspiring! Thank you!! Fantastic cards. Love the Silver Linings Sunburst colors. Thank you for sharing your ideas and being part of this giveaway. I love the cards. The silver lining dies looks like a lot of fun, can't wait to get that set. Oh my goodness JJ your cards are adorable! How creative are you? These are really awesome! Great job! Bright fun colors. Your cards are so cute! Pretty w/c. Love the way you did the sun and the sea on the 2nd card. Love this release and your cards are so cute. love how you used the silver lining as a horizon.. I love the inlays on the first card. I realized I don't do them enough. Thanks for the reminder on how nice they look! Wonderful use of the inlaid technique with the sunshine die. The nautical scene you created on the 2nd card is really peaceful. Awesome design with the sunshine inlays, love that simple design! And your nautical scene is fabulous! 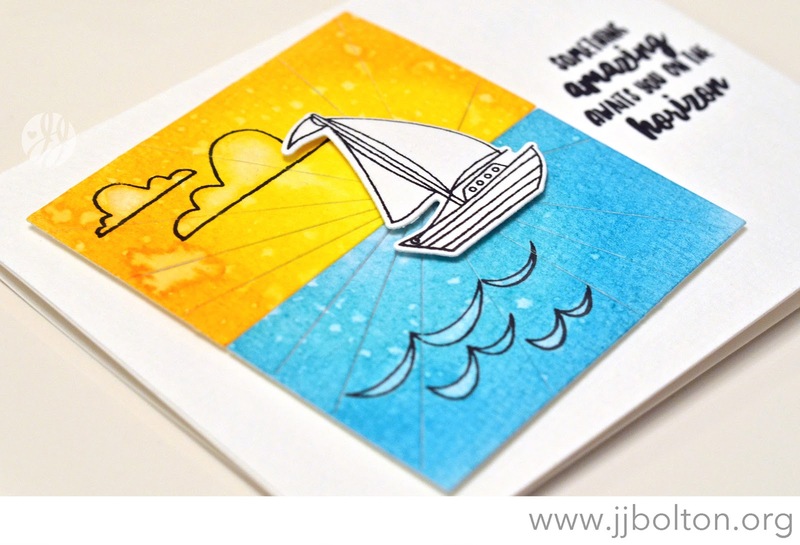 Both cards are so fun and summery but I really love the sailboat scene! It reminds me of a kids puzzle. Great use of the sun ray dies. Love the colors of the sailboat scene! I can see the Silver Linings die set as being a go-to staple for me. Love the bright colors you used with it, and I like that you tilted the panel... gives a sense of movement, which you get a lot of when at sea. Thank you for sharing your wonderful cards and the opportunity to win a stamp set from this fun release! Love how you used the sun ray panels on your card, they created a perfect ocean scene! Wow! These cards are gorgeous! Love the light, pretty colors on the first card. The die cuts remind me of sherbet glasses! And the die cut background and sentiment on the second is just stunning! What a great way to use the Sunshine die! I love it! The 2nd card has such pretty vibrant colors & the design is awesome! I need those dies!!! Great cards! Love your colors! The 'sunshine' die is a favorite, and I love the inlaid technique you used! JJ I love all those blocks of coloured sunshine, what a neat idea. So glad I ordered that die! Beautiful cards, JJ! I love how you did not color the boat. Wow - I love what you did with these dies! Beautiful cards! Hi JJ ~ Your cards are awesome and, coincidentally, showcases two of the three sets I chose for my initial purchase (one is already on back order). I am in LOVE with this release because it's fun and fresh!! Thanks for sharing your cards and I hope you don't mind if I CASE them! Love the Sunshine card! Cause everybody needs a little sunshine in their life now and then! Great colors!!! Such pretty cards. Your coloring is always so great. (I love your blog banner). Thanks so much. I love the sunshine card and the sailing sunburst! Silver lining die is so gorgeously used here...love it!!! What pretty cards. The colors are beautiful. Love the stay salty stamps. Wow...such beautiful cards! Love all these new sets and dies!!! Oh my, your cards prove what I knew already: I need it all! Beautiful! My eye was drawn to your sunset/boat/ocean card. The coloring is gorgeous!! These cards are gorgeous!! Love the one with the boat! Really like your cards great job, keep up the good work. super cute cards...love the inlaid die cutting!!! the inlaid diecutting card was soo cute, but oh that silver lining scene card? AMAZING! Oh, these are so fun, JJ! Wonderful What a wonderful release! Fabulous card using the Stay Salty set! Love how you created the scene panel and then off set it on the white card to make it pop! they really speak summer and hot. The boat card is wonderful. 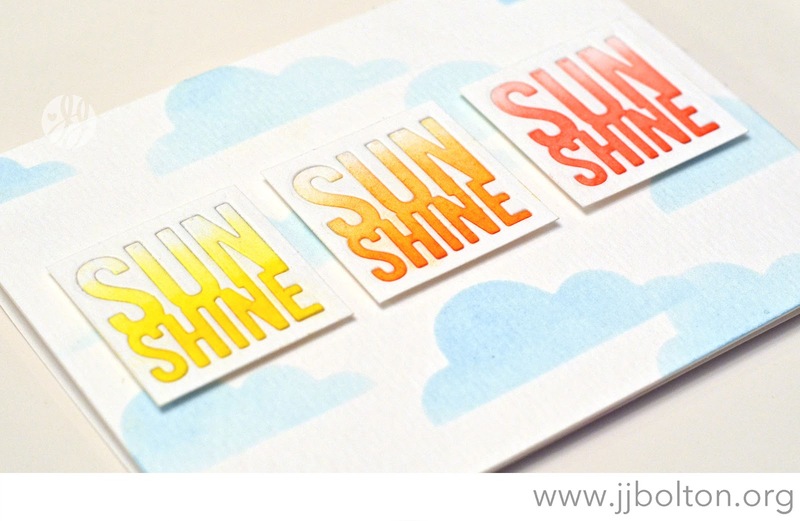 I especially love the inlaid sunshine card! Great cards, JJ. Love how you used the Silver Linings set. This is the first item on my list. Love the sail boat. The colors of sky and water are beautiful. Great cards JJ. Love the way you used that sun ray die to make both the sky and the water, awesome. Thanks for sharing with us. Love your cards. The ship background is awesome. What a great way to combine the Stay Salty and the Silver Linings sets. I love these! Your gorgeous vibrant colours really look amazing with these stamps and dies. Great designs! Fabulous cards! I particularly like your second card with its great panel set at such a jaunty angle: perfect! Thanks for the opportunity to win such a great prize: I would choose the Mondo Peony set. I love your cards! You sold me on those dies! WOW! Love your bright and beautiful summery cards! Using the sunshine 3 times for the focal was very clever! Love the sun rays done as sky and sea! Thank you for sharing and the opportunity to win! Those dies are fabulous! Love how you used them in your cards. Thanks for the inspiration! Love the boat using the 2 sun ray panels, I can almost feel the breeze! Your gallery is awesome!! Love the cards! Very clean and colorful! fantastic background on your sailboat card! Love your examples using the new release - so awesome. Fabulous cards JJ. I love your style and use of color. Your cards were happy and cheerful! Love the way you used the sun rays. Great cards, J.J.! So bright and cheery. I love what you did with the sunshine die cuts. Thanks so much for sharing with us and for participating in this great hop and giveaway. Love your card examples. Bet the new release was fun to play with! Both are cards are great. I love your use of the products you chose to showcase. I'm really loving the silver linings die. great use of it. Love this new release with some unique dies and stamps. Your cards are beautiful and a clever use of some of them. Beautiful cards! I love the new products. Lovely cards. I especially like how you used both of the "burst" dies from the silver linings set to create the sky and the sea on the sailboat card. I love all your sunshine! I live in the Pacific North "Wet" so any Sunshine is greatly appreciated! Thanks for the sunshine! OMG! The silver linings is so cute. I love this. I love both of your cards, so cute. Your cards are beautiful. I especially like the way you used t4h Silver Linings dies. beautiful cards, JJ!! Love the triple panel with the sunshine die and the inlaid technique- so cool!!! Love how you incorporated the dies with watercolors! Great cards! Love your creations. What great new stamps and dies! Looking forward to getting my hands on some of these products. I love these cards, they're so bright and happy! Just the simple words and watercolor on the first card makes me happy. The other card is so positive that it can't help but put you in a good mood! Your card designs are super creative, JJ. Love the way you used the silver linings die to cerate the horizon/ocean. Bright, sunny, fun. Nice work. Oooh, I love the Silver Linings die set! It looks so versatile! I love your sunshine cards. Cute idea. Silver linings turned out great. Thanks for sharing! great use of the products JJ! 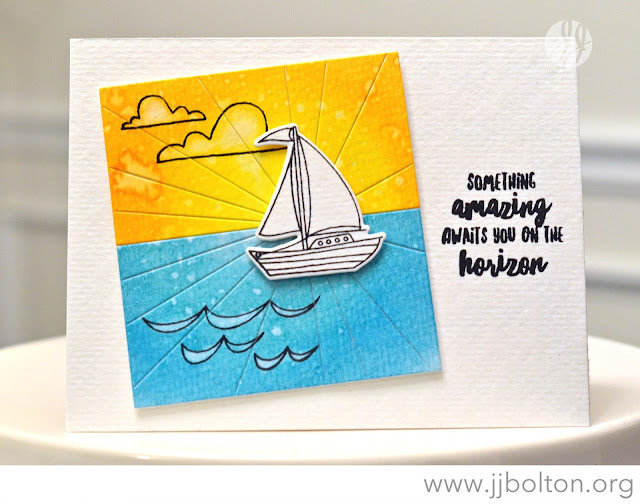 YOu really captured the Sunshine sentiment in a fun way, and of course, I love your nautical scene! Awesome being on the hop DT with you! Iam so glad you did Sunshine. I call me daughter sunshine. I like your color application. Loving the masked clouds on the first card and that great sky/sun background on the second! Great designs. Love the way you did these. Love your rainbow of sunshines and the way you combine the sun rays dies. Beautiful cards with these new goodies! We are having a VERY hot and dry summer which is unusual for us. Your cards look just like it with the bright yellow sunshine and the bright blue water of Lake Ontario! I would never have thought of using the Silver Linings that way. I love it! And the sentiments are so funny -- perfect. Thanks for sharing! Love your inlaid sunshine card the best! love the white boat on the colored scene! Beautiful cards! Can't wait to use the Silver Linings dies. I love color which means I love your cards! Awesome cards. I like the colors you chose. Your projects are just so sweet. Ah, wonderful cards, JJ! I especially loved the second one - special way of using those dies, very nice! Great cards. Love the sunshine. So pretty and fun. Your cards are outstanding! Can't make up my mind which one I love most. I even checked out your gallery. Really like your style. I absolutely love your card which used the Stay Salty and the Silver Lining sets. The colors used are so vibrant and just make the card so alive. Mahalo nui loa. Great cards! Love the sunshine! Love both cards- the inlaid technique is perfect for the sunshine die, and the full ray design of the sailboat card really sings to me! Thx for inspiring ! JJ! Awesome cards, as always--totally love your style! Love the way you put together the Sushine card, simple and clean. your cards just made me smile real big!! almost like you actually sent me one of them! thanks for starting my day on a happy note! Both cards are lovely! The second is my favorite, so, so pretty and I love how you used the new EH die twice! Clever! I love the sailboat card with the sky and the sea made from the sunshine die. Two sweet cards!! I love your fun designs!